Bella Ciao Superba: Ready and Available! Fashionably late and appropriately glamorous, the Bella Ciao Superba is here! I was nervous up till the moment I saw it, but the bicycle is perfect. The pre-ordered bikes should be off to their owners very soon. To recap for new readers, this is the result of a collaboration between myself and Bella Ciao, and you can read about it here and here. 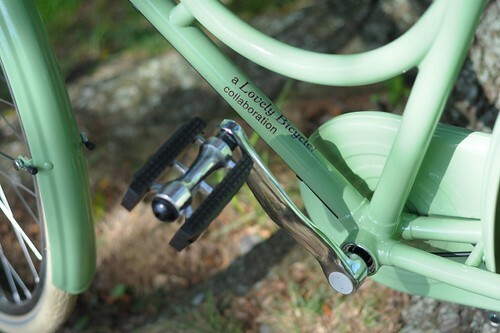 Twelve bikes were made as a special edition and they are available exclusively at Harris Cylery in West Newton, MA. I know that a good portion of them have already been sold, so please check with Harris for availability. The price is $1,495. I am not the one selling the bicycles (and I do not receive commission on the ones sold), so please contact Harris directly with all sales inquiries. The Bella Ciao Superba frames were handmade in Italy, using Columbus Thron tubing. The frame size is 54cm, with 700C wheels. Tires are the cream Schwalbe Delta Cruisers, 700Cx35mm. The wheelsets are proprietary to Bella Ciao, made inhouse. The Superba includes all the components and accessories pictured here, which I will detail below. 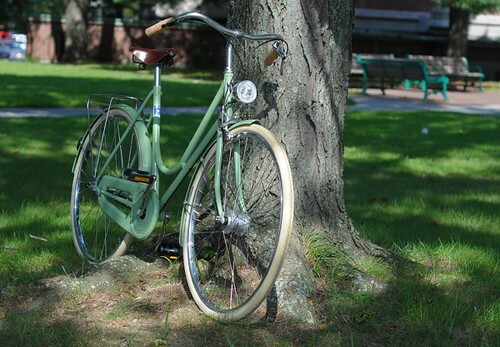 It is a 3-speed bicycle with a rear coaster brake and front handbrake, internally routed dynamo lighting front and rear, leather Brooks saddle, natural cork grips, chaincase, and a handmade rear rack. The stainless steel racks were designed by me and handmade in Dorcester, Massachusetts by Trimount Ironworks. They are rated to carry 18kg (40lb) of weight, provide attachment for bungee cords, and will accommodate a variety of pannier systems. 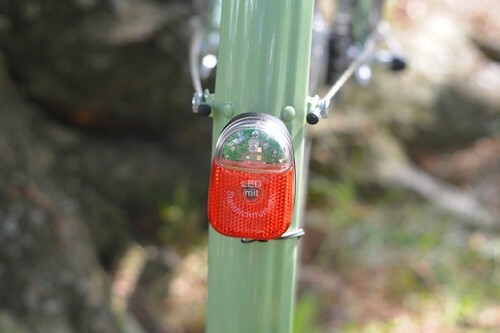 There is a provision for attaching a battery-operated tail light to the rack, for those who wish to supplement the dynamo lighting. One thing I like about the stainless rack with its thin tubing, is that it has the effect of being "invisible" on the bike. I've played around with a number of different racks, and this definitely suits the bicycle best. I may write a separate post about the rack design in the near future. 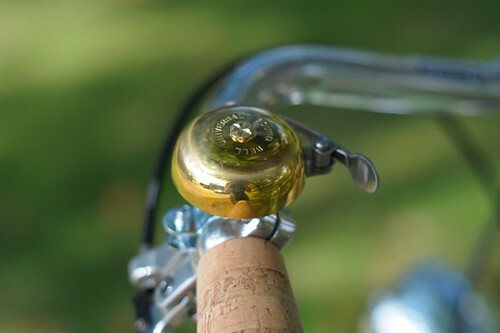 The high-polished alloy handlebars are made by Bella Ciao. I would describe them as a hybrid between North Road and Porteur style bars, and they are possibly my favourite handlebars on the market today. 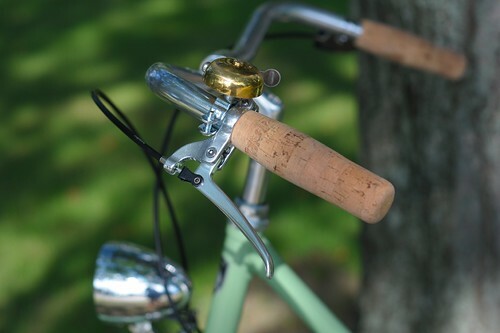 The bike is fitted with natural Portuguese cork grips from Rivendell and elegant Tektro city brake levers. 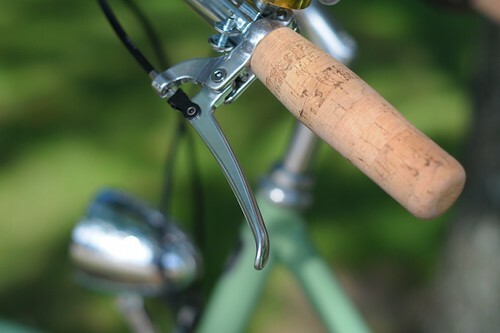 The cork grips will be left unfinished, but they can be shellacked by the owner - which will make them darker. 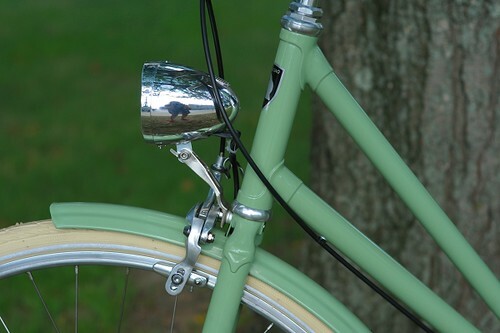 The brake lever can be placed either on the right or on the left. The dynamo-powered lighting is by the German manufacturer Buechel. It looks fairly classic and unobtrusive, and works nicely. The dynamo hub is Shimano. The wiring is routed externally up the fork, then internally through the frame, exiting through one of the chainstays. 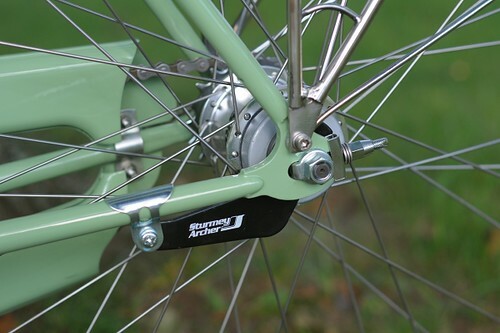 Sturmey Archer 3-speed coaster brake hub. And the fork ends/dropouts (I like to remove those black dust caps, but forgot to do it here). You can also see the bungee cord attachment point on the rack here. The colour of the bike as it shows up in the pictures here is fairly accurate. 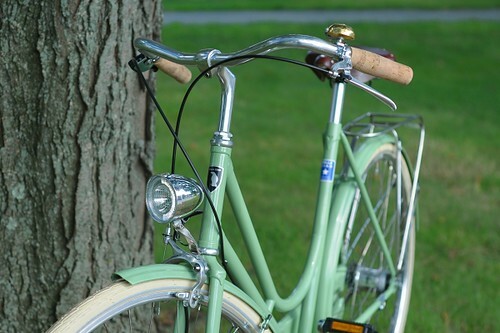 It is not the same colour as my own bike, but a more vibrant, saturated pastel green. If you have any questions about the features, I will be glad to answer them here. I hope that the owners of these bicycles will be pleased with them - I am very happy with how they came out. There is some talk of more bikes, but nothing is certain yet - so your thoughts are welcome. Many thanks to Bella Ciao again for the opportunity to work on this project, and many thanks to Harris Cycley for all of their help. Congratulations on successfully bringing this project to completion. You did a beautiful job. beautifully done! 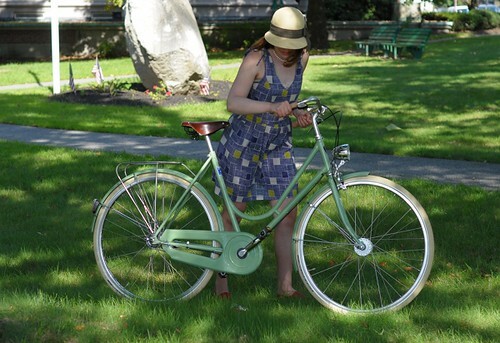 it looks great, and if my wife didn't have a bike already, I'd want to get her this. congrats on the completion of this project too. Stunning! Simply stunning. You can just tell by looking at this bicycle that it was a labor of love. I am excited to hear all the lovely adventures people will be having on this bike. BTW...I am in love with that rack. Why is it so hard to find a simple, lovely rack like that out there? I especially like its powers of invisibility. I would want something like that on my Betty Foy. In fifty or a hundred years, maybe some new generation will be restoring these, and researching the original blog posts as historical archives. Pretty cool. Do you anticipate any future production cycles? Maybe a full Mixte based on your custom frame? Looks great! A perfect city bike. Any plans for a second production run? Any plans to introduce additional frame sizes? You did a great job on this! 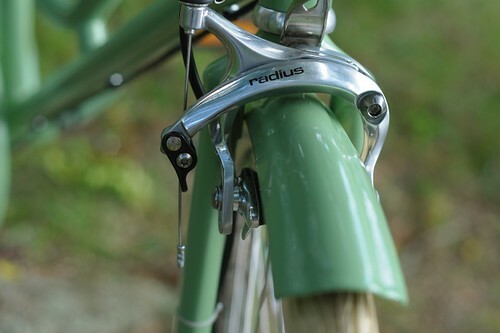 The bicycle is beautiful and the details are so carefully thought out. I'm reminded of how much overlap exists in our concepts of what makes a lovely bicycle. Congratulations on a successful project and thank you for sharing it with us so thoroughly. great collaboration! love the handle bars and color of the frame. Thanks, thanks and thanks : ) It made my day/week/month to see this bike all finished at Harris. I also can't stress enough to what extent they have been helpful and supportive. Sam - I wonder whether the current blog system will be transferrable to the telepathic internet that will surely be established in 20 years time. I am able to offer one-off mixtes with custom (handmade) lugwork in collaboration with Royal H. that will be similar to my own bike "only better." A production mixte is not possible, because the split headtube lugs are no longer available. One potential way to do it would be to collaborate with someone like VO who has access to them in bulk, and I may suggest that to them at some point in the future. Beautiful. How much does the bike weigh? We haven't weighed it, but it feels like 35lb or so to me. 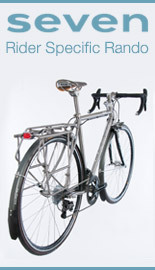 Kara - I can recommend Aaron at Trimount Ironworks and also John Gehman at Red Barn studios for custom rack-making. Surprisingly, it is not much more than a ready-made rack. Drop me a line if you'd like more info. Walt - Nah. My own bike is just as light of a colour and there is no dirt on it. I rode it in the winter, too. What is more noticeable on a lighter bike though are scratches on the powdercoating. somervillain - There may be another batch, but it's not certain yet. I would love to work on a men's version, and a handbrake (no coaster) version, but is very difficult to gauge interest. To *the anonymous donor*, I was having one of those weeks, and then all of the sudden: "Superba has arrived at Harris Cyclery!" The perfect pick-me-up, truly. I just can't wait for this bike, and I still don't believe I will actually own it. V, that color is so awesome! It turned out so, so well! (I hesitate to say) It came out even better than I imagined! 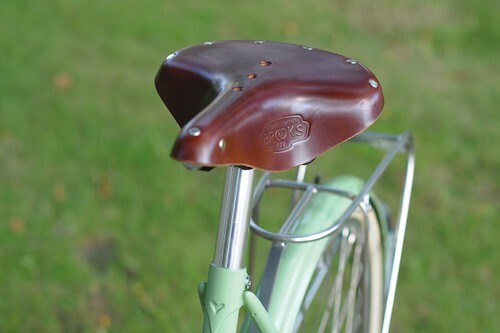 Can you recommend a brand/shade of shellac for the grips to match the saddle? (Although, the bike looks so bright and inviting without it.) I have no experience with this kind of project other than your blog, but I have a friend who does, so no real urgency. Julia - Thanks for your patience! I like how the frame colour came out as well. 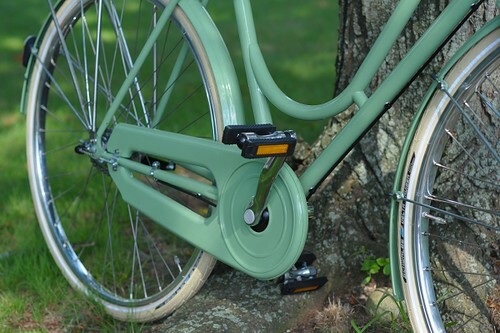 But beware: It is startlingly vibrant compared to the army green of my bike! I use Bullseye brand of shellac. Clear with darken and warm up the grips a bit, amber much more so. This bike is gorgeous. Your idea behind the invisible rack is genius. Congratulations to you and your collaborator on a beautiful design and of course I love the color. Well done, it's a beauty! Very, very pretty. Love that shade of green. What a great looking bike! Harris is a good shop, very nice folks, especially Mr. Harris himself. There are two Mr. Harrises, father and son : ) Both very nice! It looks great! 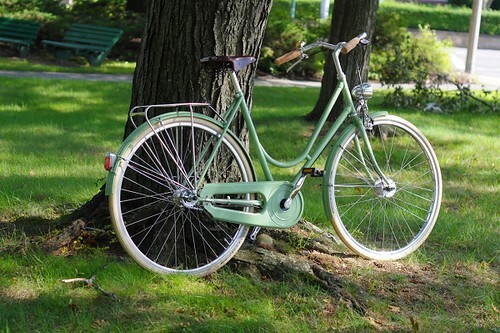 I actually prefer the color of your bike because I am a little grey mouse type, but this is gorgeous. I especially love the rack. Racks are so hard. Great job! It is the fascinated bicycle! I know BellaCiao Bicycle by this blog. I use Bellaciao handlebar and grip. Fantastic. Love the color, the rack, the bars, everything. Congratulations! Wow. Beautiful combination of components and materials. Back rack design is lovely. That is a gorgeous bike and it has all the features a girl could want on it. I would love to get such a bike as I am thinking of selling one of mine and want to replace it, with something like this, but in Australia I don't think it is possible unfortunately. What a great looking bike. Though I need another bicycle like I need a hole in the head, I hope they still have one to look at at Harris when I visit in a couple weeks. Anon 12:47 - Lighting is available on some of their bicycles as a custom option, but in the future there might be a model based on the Superba that includes it. They are looking into the possibility of mass-producing the rack. What an accomplishment! Congratulations on your project coming together so beautifully! She is a gorgeous bike, perfect color. 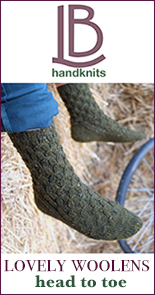 What a fantastic shade of minty green! Love it, as well as the rear rack. I wish I could afford one of these beauties. I love the colour. Only nit: I would have reduced the size of the words inscribed on the tube. Oh the "Lovely Bicycle" inscription is small, and sort of underneath the tube; it's a close-up shot. Also, it can be removed. Congratulations, Velouria! They came out beautifully. The rack ended up being a really elegant & harmonious detail. It will be very interesting to see these when they hit the streets and other people get to ride them, review them, and post their own photos. velouria! this collaboration with you has been a great pleasure. you once said, that you did not fully knew what interested you in BELLA CIAO - you did not fully knew what drew you to our bicycles - and that you needed to explore that. i look at your SUPERBA now and i see - although unmistakably much of our hardware - a clearly independent and unique spirit. - undoubtedly you have brought something to life here. and maybe it is this that you wanted to explore. 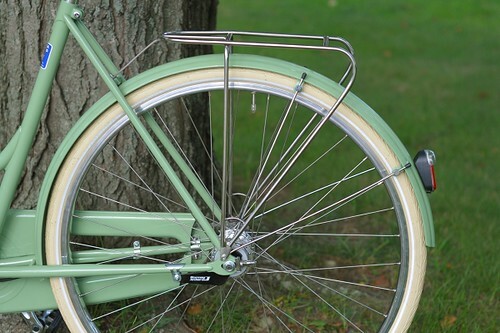 anyhow: the soul also lives in the details - and this rear rack is a true masterpiece. for many, many years many had tried designing a rack for this iconic italian step through frame, and - to my information and standards - most had failed..
very nice work! it needed a rack that would not be there. it is not there - and very elegantly so. Sigh. This bicycle is reminiscent of the one I had when I was a kid-- same color, with lights (that didn't work, alas), a rack (although it was painted the same color as the bicycle), and a molded chainguard (although it wasn't a fully enclosed one). Beautifully done-- great work. Is there a diamond frame version of this bike available? Perfect. Perfect. Perfect. 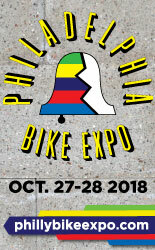 I have been following the Superba progress and want one desperately but unfortunately can't test ride or even see the bike in person beforehand. 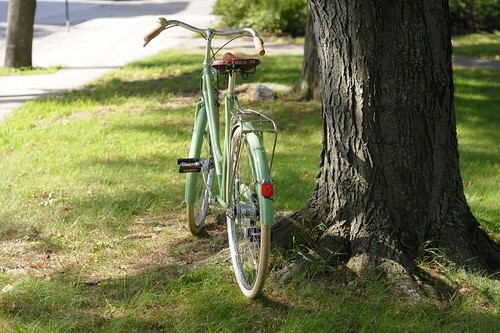 Right now I'm riding a vintage rabeneick lady bike 54 cm and 26" wheels. I have the saddle on low and can still touch the ground with my toes.. your opinion and advice will be appreciated. So beautiful. Please keep collaborating. Just gorgeous! 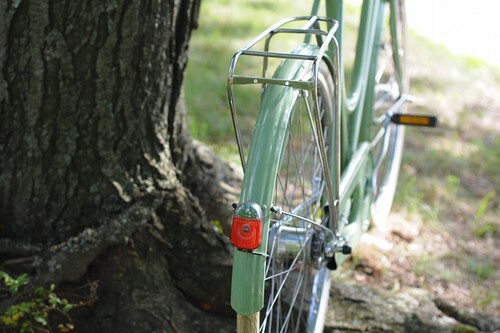 That rear rack is very elegant and unobtrusive. Congrats on your project, I'm sure those bikes will fly out the door. Bella, bella, bella! I think the only thing keeping me from buying one if these is the coaster brake. That is not something I could live with. Good thing there is that, I do not have room for another bike! Anon @ Aug 27, 4:29 - The levers look like Tektro FL750. I wondered when we'd get to see this machine. Very nice. There needs to be more bikes like this about. Gosh! Why aren't you in England? This is a lovely bike, indeed. 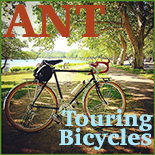 I really enjoy your blog and you make me want to get on my bike straightaway. hello. just grabbed the last superba from harris. such a beautiful bicycle... i could stare at it for hours. 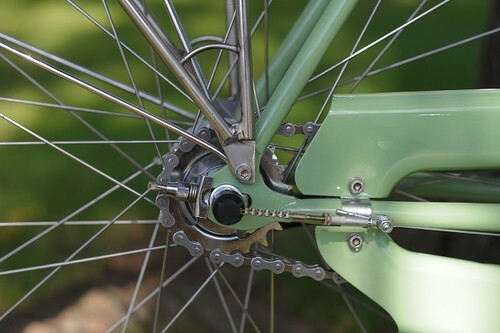 do you know if it would be possible to mount a rear break? i'm wondering if i have the option to go single speed/freewheel in the future. thanks. 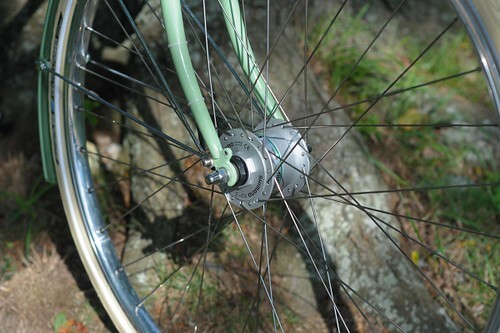 can i mount a rear brake if i want to go freewheel/singlespeed on the superba? beautiful bike! David - As far as I know, the brake bridge is not drilled on these (check yours?). You could, in theory, have it drilled professionally. Even Harris might be able to do it. Cindy - I love the look of BEG bikes, but have never seen one as they are not available here. Will be sure to write about them if I encounter one. hasenschneck - I lived in England in my 20s. A formative experience, including the influence on my taste in bikes! What is the seatpost angle -- does it allow for sitting up completely straight? Also, what would it take to have hill-climbing gears and a hand-brake for the rear as well? Molte bene, where can I get one? I am going to Italia for the grapes are now ripeining and v. soon I will require the best of transportation money can buy. Do you think the fit for work for us taller ladies (5'10'' to be exact)?